When it comes to investing, it’s easy to get lost in the details of analysis and strategy while forgetting the noble purpose to which all its efforts are truly dedicated: helping families. My favorite part of this job is when I get to see, first hand, why we do what we do. In a recent meeting, all four generations of one of our families were in the same room. The hopes and dreams of the family were all there together. The first generation created the wealth. Its team of husband and wife devoted a lifetime of toil, dedication, and sacrifice to plant the tree - decades ago – that had grown to now shelter and protect the entire family. The work didn’t stop there, however. Now mature, that tree must continue to thrive, if it is to serve for generations to come, the family that created it. And when I say serve, I don’t mean simply meeting the material needs of the children, grandchildren, and great grandchildren who were gathered there that day. Its purpose is far greater than that, because it is also tasked with furthering the family’s legacy in the causes it has chosen to support. These are all multi-generational goals. This money has to be there for them. The tree has to keep growing. But what is the best way to ensure that it grows? While we were meeting, the markets raged outside, presenting a clear challenge to the goal of long-term growth. As the market collapsed into the holidays, it was on pace to clock the worst December ever. The S&P 500 index of stocks fell approximately 14% in the fourth quarter alone, one of the most traumatic quarters ever. During this collapse, the most aggressively positioned investors suffered even bigger declines. We believe this most recent quarter provides yet another example of why we think the best way to compound wealth over time is to be willing to adjust our investments for where we are in the cycle. This means that, if we believe it’s best to take less risk and be more conservatively positioned, then we are happy to bide our time waiting for a different set of opportunities as the cycle progresses. This doesn’t mean that we sit on our hands in cash, doing nothing. It means we strive to seek out what we think is the best mix of investments. If there is one thing that I have learned through trading all the hundreds of cycles within which I have invested, it’s that the nature of opportunity changes as the cycle changes. Assets that may have once been unattractive and expensive at one phase can become the table-pounding buys at a later phase. We take this into consideration as we evaluate our potential investments. For instance, just this week, one of the world’s most respected global asset allocation companies, GMO, authored a provocative white paper. It showed that the recent market decline was only the fifth episode since 1881 featuring such an explosive downward move. Below, we illustrate what we think is the most important chart from that white paper. 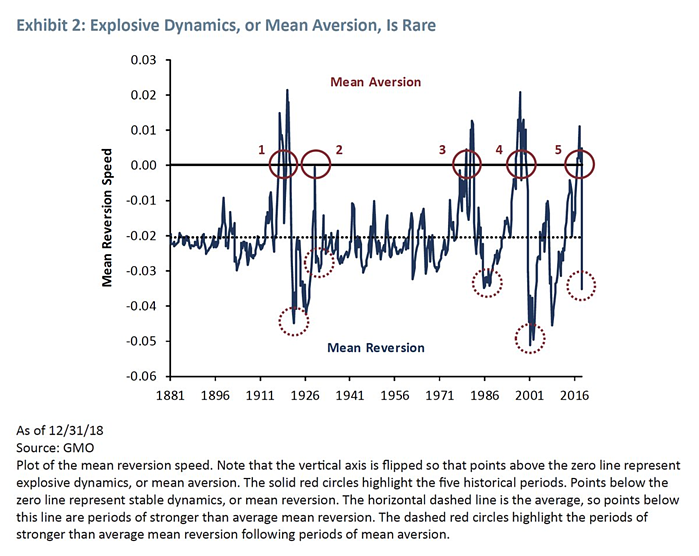 GMO cites this price action as potential evidence for explosive mean reversion that takes place infrequently during the combination of full valuation and bullish sentiment. If GMO’s conclusions are correct, then we believe future observers may look back upon our times and number them among such historic examples as the volatile markets of 1929, 1987, and 2000 – all examples of times when thoughtful investing and global diversification were critical for long-term success. Only in retrospect will we know if GMO’s suspicions are correct. We would be the first to say, and have said already many times, that no one has a crystal ball when it comes to the markets. So, our goal has never been, and will never be, to “time the market.” But at the same time, neither will we “set it and forget it” when it comes to what we think is the ideal portfolio. In our view, all markets are not equal in their balance of risk and reward. Rather, we strive to adjust our investments to what we think is the ideal mix we believe takes advantage of potential opportunities while remaining mindful of the challenges of the day. This is tailored - of course – to the long-term goals for which the money is being managed with regard to individual risk tolerance. In my opinion, if ever there were a quarter that proved the merit of diversification, surely it was the fourth quarter of 2018. In what I believe was surely a shock to most, the strongest performance came from assets neglected during this bull market – such as U.S. Treasury bonds, which rallied 9% from their lows to the end of the quarter while many U.S equities suffered. Other traditional portfolio diversifiers such as gold and gold stocks, also printed the strong performance of 8% and almost 20% respectively off of their lows. We believe this most recent quarter provides yet another example of the importance of diversification and why we think the best way to compound wealth over time is to be willing to adjust investments for where we are in the cycle. Our goal is that our returns are not held hostage by “the market.” After all, how many different kinds of markets are there anyway? Equities, fixed income, and commodities globally. There are hundreds of markets and tens of thousands of investment opportunities. We select only a tiny fraction of them, and their returns can be strikingly different, a point we believe can be demonstrated in the example above from the fourth quarter. So, we are not scared of volatility. We are valuation-driven investors who seek the best opportunities we can find globally. We have devoted our entire investment career to capitalizing upon cyclical change, with the goal of making volatility our friend. As you have no doubt noticed, volatility has returned. We think it may well prove to be a good thing for our style of investing. So, as I sat in that family meeting, I was calm despite the storm raging outside in the market, because I firmly believed that our team had already prepared for it. I can’t begin to describe my profound gratitude for being invited into that room, surrounded by four generations of one of our families. I can think of no higher honor for investors than to see, firsthand, the real impact of their work and to see why what they do matters. For me, it made all the years of worrying over our investments worthwhile, easing for one moment the constant burden of navigating uncertain times for a goal that lies many years into the future. I believe the common thread in all these efforts, if they are to prove successful, is that they will all be based upon the foundational principles of diversification, patience, and the steady execution of the long-term plan that we communicate in these letters. As always, we are humbled and honored by your support. CWA Asset Management Group, LLC is an SEC-registered investment adviser, doing business as Capital Wealth Advisors and as blueharbor wealth advisors. Fundamental Global Investors, LLC is a SEC-registered investment adviser that is affiliated with CWA Asset Management Group, LLC. Information presented is for educational purposes only and does not intend to make an offer or solicitation for the sale or purchase of any specific securities, investments, or investment strategies. Investments involve risk and unless otherwise stated, are not guaranteed. Nothing herein should be interpreted as investment advice. Be sure to first consult with a qualified financial adviser and/or tax professional before implementing any strategy discussed herein. Specific companies or securities described in this report are meant to be illustrative of investment style. Such case studies are not meant to be, and may not be, representative of any portfolio or holdings of CWA Asset Management Group, LLC, or Fundamental Global Investors, LLC. Please note that past performance is not indicative of future results. This material is solely for informational purposes and is intended only for the named recipient. Nothing contained herein constitutes investment, legal, tax or other advice nor is it to be relied on in making an investment or other decision.